Recorded in many forms including MacConachie, MacConnachie, Macconachy, Macconaghy, Macconchie, Macconchey, Macconachie, Macconnachie, Macconechie, and in the short spelling as 'Mc', and sometimes particularly in Northern Ireland, without any prefix at all as in examples such as Connechie, Connochie, and Coonechy. However spelt this notable and long-established clan surname is of Scottish origins and is an anglicized form of the pre 10th century Old Gaelic "MacDhonnchaidh", meaning the son of Donnchadh, the modern Duncan, an ancient male given name ultimately derived from the Celtic "Donno-catus", with "donn", meaning brown, and "cath", a warrior. On an ogham stone at Glan Usk near Crickhowel in Wales the name appears as "Dunocatus", which points to "fort warrior", from "dun", fort, and "catus" (as before). The Clan Donnachie (Clann Donnchaidh) of Atholl, are so named from Donncha Reamhar (Duncan the Fat) de Atholia, who lived in the reign of Robert the Bruce (1306 - 1329). Three Argyllshire families were also known as "MacDhonnachie", the first, MacConchie of Inverawe, an old sept of the Campbells from whom the Macconnachies of Meadowbank in Midlothian are descended; the second, MacDhonnachie Mhor or Campbell of Duntroon, Argyllshire; and the third, MacDhonnachie of Glenfeochan. The Inverawe sept are descended from Donachie Campbell, son of Sir Neil Campbell who died before 1316, and Johnne M'Conquhie, alias Campbell, tutor of Inverawe, gave his bond of manrent in 1585. Examples of the name development include John McConchei, a burgess of Inverness in 1652, and on August 5th 1744, the christening of Hugh, son of John McConachie, took place at Kilfinan, Argyllshire. 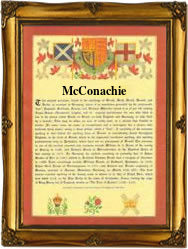 The first recorded spelling of the family name is shown to be that of Angus M'Conchie. This was dated 1493, in "Parochial Registers" of Argyllshire, Scotland, during the reign of King James 111 of Scotland, 1460 - 1488. Throughout the centuries, surnames in every country have continued to "develop" often leading to astonishing variants of the original spelling.